Real life stories that will inspire you to live your dream life. 1. Add Becca Highlighter To Your Daily Makeup Routine ASAP. I used to always be rushed in the morning and skip steps to my makeup routine like filling in my brows or applying highlighter. But since I’ve been waking up so early feeling all energetic and refreshed (thanks to keto!) I have had more time to spend on my makeup and now I can’t live one day without applying highlighter. It gives you that perfect amount of dewy glow without looking greasy. My favorite one is by Becca (in Opal) and can be purchased here. I promise you it’s a game changer! 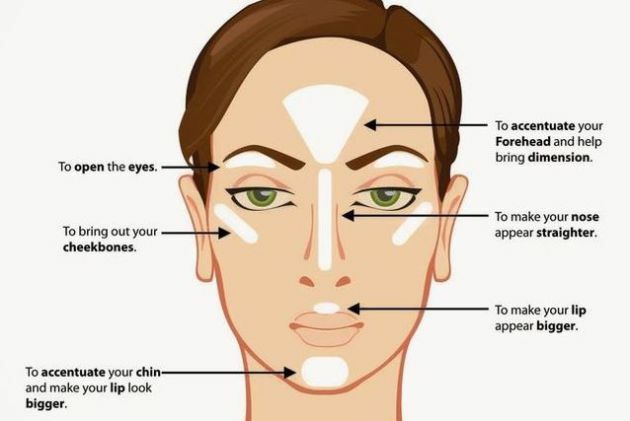 Follow the diagram below to learn where on the face it should be applied. 2. Go A Little Blonder. There’s something about your hair being a little bit lighter that freshens up your entire look and gives a little more contrast to your skin, making you instantly appear tanner. I recently went blonder and suddenly felt like I had spent much more time in the sun than I actually have. If you’re a dark haired person who would never go blonde, adding a tiny bit of dimension can brighten you up without having to totally change your look. That’s why balayage is the best trend ever. If you’re in the market for a new colorist and you live near Detroit, LA or Nashville, give my girl Sam Glamm a call. 3. Drink Ungodly Amounts Of Water. They say the healthy amount of water to drink per day is half your body weight in ounces. I now drink even more than that, but I just recently started to really ensure that I never skimp on my water consumption each day. I can’t tell you what a difference it makes for your skin. Not just your face, but all of your skin looks and feels better when it’s hydrated. I quit drinking soda several years ago and my “treat” drink in the middle of the day is La Croix. I just love the bubbles. Jordan and I both have reusable 32oz water bottles that help us track our water each day. (It’s also much better for the environment than plastic disposable water bottles and saves you money!) And starting the day with a glass of water before you have any coffee in the morning is a great habit to get into! 4. Wear SPF 30 All Summer. I’m not afraid to admit that I was that person back in my teen years who wore SPF 4 oil at the beach and thought I would become a golden goddess. Even after all the painful sunburns on my poor Norwegian skin, I kept making the same mistake over and over. I had to become a responsible adult before I realized that wearing SPF 30 (or more) protects you from the sun while still allowing you to obtain a beautiful summer tan. No one wants fried peeling skin, so make sure you put your sunblock on everywhere before going outside. And keep reapplying if you are spending the whole day outdoors. I have successfully had two lake days already this summer without getting a sunburn (thank you very much) and I have still managed to acquire a little golden color to my usually pasty skin. 5. Pay Attention To Your Gut Health. Did you know? Skin issues such as acne, rosacea, dry skin, and eczema can all be triggered by poor gut health. The nutrients from food that your body needs are absorbed through your gut. If your gut health is lacking, you won’t get all those nutrients and you can quickly notice changes in your skin, nails and hair. As women, those are some of our finest assets, so let’s not let them suffer. If you read my recent blog post about the ketogenic diet, you know Jordan and I recently did a four day bone broth fast which not only cleared the stored glycogen out of our bodies before switching to a high fat diet, but it is also extremely helpful to the healing of your gut health. It was three days into the bone broth fast when people started commenting on my glowing skin. I’m telling you, it makes a big difference! To help your body absorb all the proper nutrients, I would suggest adding bone broth and probiotics to your diet and cutting out as many processed foods and refined sugars as you can. So there you have it… my tricks to achieve that coveted summer glow without having to get pregnant! 🙂 I promise you’ll start getting compliments in no time if you apply these guidelines into your life this summer. I’m living proof that they work! Go get your glow on, girl. And let me know how these worked for you! Hi boo! What color Becca do you use? There are so many tints?? Copyright © 2018 Left to Write was created in Nashville, TN in 2016 by Deidre DeFelice.